Interested in coding, but don’t know where to start? Or perhaps looking to add that personal, interactive touch to a craft project? The Love to Code (LTC) system from Chibitronics is designed to enable beginners of all backgrounds and ages to try out programming without the frustration of installing software. If you’ve browsed the web on your laptop, smartphone or tablet, and used headphones to listen to music, you know everything you need to get started! The Chibi Chip is the heart of the LTC system. You can use the Chibi Chip to bring life to your Chibi Lights LED stickers by making them blink and fade. Add interactivity to your greeting cards and projects by connecting switches and sensors to your Chibi Chip. 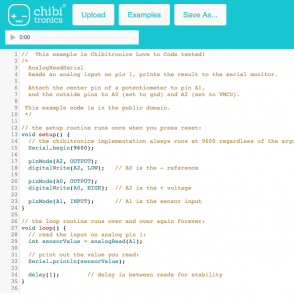 You get to pick how to make the programs: either by dragging-and-dropping blocks together using Microsoft’s MakeCode Editor, or by writing Arduino-style computer code using Chibitronics’ LTC Editor. The Chibi Chip contains a tiny computer known as a “microcontroller”, which records instructions via a headphone jack. The Chibi Chip features six independently programmable ports that can drive LED stickers, or can be used as inputs from switches and sensors. It also has the ability to drive chains of special LTC Rainbow stickers (known as WS2812B LEDs or Neopixels) which unlocks the full spectrum of color for your projects. This “Chibi Chip Microcontroller Board & Cable” kit comes with the Chibi Chip and a special power + programming cable. You will need to provide a regular “Type A” USB port for power, and a web-enabled device that has a headphone jack for programming. The Chibi Chip works with the latest Chrome, Firefox, and Internet Explorer browsers on both mobile and desktop devices. If you have any doubt if your browser is compatible with the Love to Code system, just visit https://ltc.chibitronics.com/test and follow the instructions. When you tap “Test Audio”, the test site will generate a short tune using the same technology we use to program the Chibi Chip. If you can hear the tune, you’re good to go! Please note that this listing is a Chibitronics.com exclusive Beta sneak-peek of an LTC product. As such, we’re currently inviting more experienced users to purchase Chibi Chips and try them out. We’re eager to hear your feedback and how we can improve the LTC experience to deliver on our pledge of simple, barrier-free learning. We pledge to do our best to support any issues you may have, but by purchasing this product you acknowledge this is a Beta version and the final release version may have important improvements compared to the Beta version. Be sure to keep the Bitmark serial number included inside the box of your Beta units, as each one is a unique key to unlock future benefits for participants in our Beta program!